First Aid Station Dimensions: 15"x22-3/8"x5-5/8"
westcoastmedicalsupply.com is your online source for first aid kits and industrial first aid stations for business and industrial workplaces. 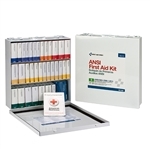 Rest assured that our industrial first aid stations from First Aid Only have all of the first aid supplies that you need to assure OSHA compliance and ANSI standards. Our industrial workplace first aid stations are a great option for a variety of workplace settings like construction sites, office settings, manufacturing facilities, childcare, restaurants, schools and much more.